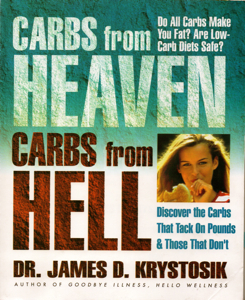 Dr. Krystosk has done an outstanding job of explaining the difference between good carbohydrates and bad carbohydrates in his book, Carbs from Heaven, Carbs from Hell by Square One Publishers. From a historical, chronological viewpoint the author explains the background of this debate in Part 2, Chapter 3, called “The Rise and Fall of Carbohydrates.” Basically, humans survived on carbs, so eliminating almost all of them from your diet, as Atkins and others suggest, is not a healthy option. In Chapter Five, however, he explains how refined carbs, such as white bread and white rice (carbs from hell) cause biochemical imbalances and can lead to insulin resistance and possibly diabetes, stress the adrenals, and cause behavioral problems. My favorite chapter in Part 2 is the one entitled ‘’Diets of the World.” Here the good doctor provides us with several food pyramids that he compares in what he calls: The Good, the Bad, and the Ugly. Starting with the Fast Food American Diet from The USDA Food Guide Pyramid that he labels “A Dinosaur Heading from Distinction,” to the Latin-American, Asian, and Mediterranean pyramids, which emphasize good carbs, proteins and fats, we can see he is heading in the direction of the foods basic to these three cultures. In Part 3 Dr. Krystosk gives us a prescription for wellness and discusses weight loss in what he calls The 7-Step Knockout Weight Loss Plan: 1) Find a wellness Buddy, 2) Eat “Carbs from Heaven,” 3) Avoid Your Allergy Foods,” 4) Optimize Your Liver & Intestinal Function, 5) Drink Plenty of Pure Water, 6) Eat Fat That Melts Fat, and 7) Don’t Worry, Be Happy!” These steps are discussed throughout the chapter. Of course, no book on good carbs/bad carbs would be compete without recipes, which is in Part 4, entitled The American Mediterrasian Diet, a term he coined, which combines the best of the world’s diets in his estimation. Here is one that is perfect for the warm weather on its way. This nutty smoothie is a Mediterranean bonanza of flavors and chock full of healthy phytochemicals & monosaturated fats. 1. 1. Place all of the ingredients in a blender, and blend until smooth. 2. 2. Pour into a tall glass and serve. Carbs from Heaven, Carbs from Hell is a 289 page paperback book from Square One Publishers and costs $16.95. 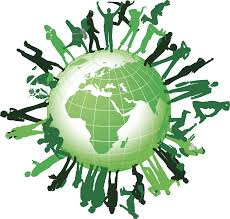 The comprehensive overview of this topic belongs on your reference shelf. when it is grown. This is not true with organic peanut butter. Today’s Earth Day, Every Day Hint: This recipe uses all plant ingredients. Phytochemicals are chemical compounds that occur naturally in plants and monosaturated fats are healthy fats, so this recipe is a good example of a positive step towards eating lower on the food chain and therefore having a smaller impact on the environment. This entry was posted on Monday, April 14th, 2014 at 1:29 pm	and is filed under Reviews. You can follow any responses to this entry through the RSS 2.0 feed. You can skip to the end and leave a response. Pinging is currently not allowed.